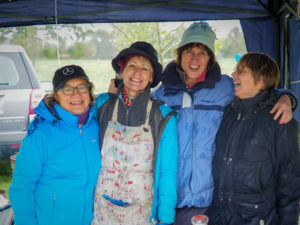 The photos don’t lie – Apple Day 2018 was an exercise in endurance for the helpers! 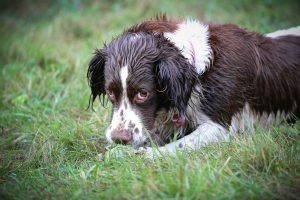 Despite a glorious summer and lovely weather either side of 6th October, we were really unlucky with the weather this year. 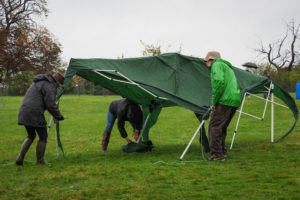 Not only was it wet all day, but it was also cold and windy – far from ideal! 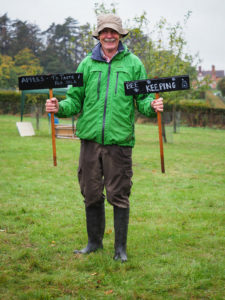 Visitors were, however, still keen to support Apple Day at the Orchard – now in its 10th year. 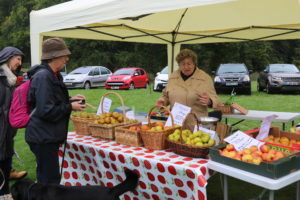 As usual we had family activities, lots of unusual local apples for sale and to taste, as well as apple-based food and drink – barbecued pork and apple sausages, apple juice, cider, cakes, jams and chutneys. 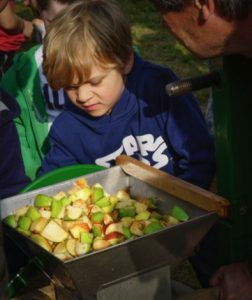 In addition to the apple pressing and juice tasting, children were able to try their hands at apple printing or making bird feeders using apples and seeds. This year we increased our range of single variety juices – together with the ever-popular early apple Discovery we were offering Lord Lambourne, Cox’s Orange Pippin and Kidd’s Orange Red – people who sampled these were amazed how distinctive they taste and pronounced Kidd’s Orange Red to be ‘the taste of Christmas’! 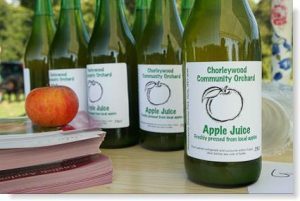 Anyone who missed Apple Day can still purchase these and our delicious blended juice by contacting Orchard Chairman Alison Rubens on 01923 282937. 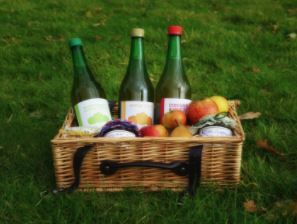 Delivery locally can even be arranged for purchases of 6 bottles minimum. Stocks of the single varieties are limited so don’t delay. Our homemade jams, jellies and chutneys – including damson and orange jam, apple, chilli and calvados jelly and spiced plum or apple chutney – are also still available for sale. These are made from locally picked fruit and make ideal foodie gifts. Contact Alison for details of what’s available. 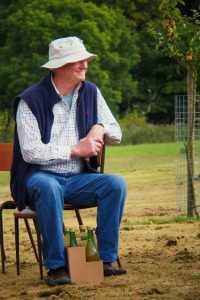 Chorleywood Cider Club goes from strength to strength, refining and improving their cider each year. This year they were selling delicious 2017 ‘Old Hoody’ in still or sparkling versions. The new 2018 vintage is already under way, containing a selection of cider apples from the Community Orchard with the rest picked at a nearby orchard in Sarratt. The morning of 7th October started with light drizzle but cheered up after an hour – this now seems to be the norm for our recent Apple Days. Once again though, our visitors weren’t put off and we welcomed record numbers of families to a bigger and better event, with more attractions than ever. 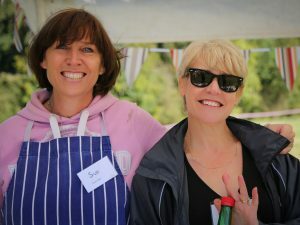 The BBQ team worked hard the entire time and served over 350 delicious pork and apple hot dogs (containing our local apples of course). 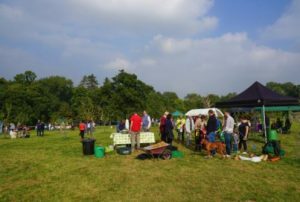 The accompanying plum and apple chutneys were very popular and many visitors combined a hot dog with the obvious perfect drink – a pint or a half of our local cider from the Cider Club bar. Young children’s activities were once again run by Little Cakes Montessori School, while older children enjoyed using the apple peeling gadgets and operating our traditional press and crusher to make delicious juice. 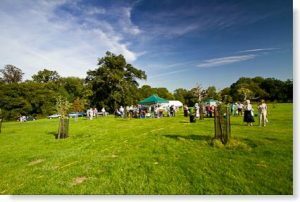 And running around or rolling down the grassy slopes was also popular – the Orchard is a great place to rediscover the simple pleasures of outdoor play. 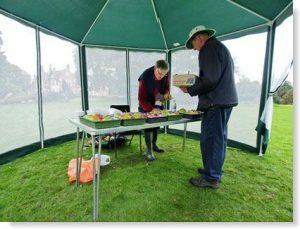 Many unusual varieties of locally grown apples were tasted and sold – including Blenheim Orange, Ellison’s Orange, Ashmead’s Kernel and local Hertfordshire varieties Brownlees Russet and Lane’s Prince Albert. Each year these are more sought after by our visitors, which is very gratifying. 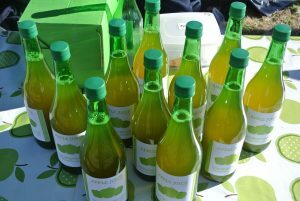 Thanks to a bumper apple harvest in 2017, we also had a range of different apple juices to sell, blended or made from select single varieties, with Bramley’s Seedling and Kidd’s Orange Red being particularly popular. Our volunteers had also made plenty of wonderful jams, chutneys, cakes and biscuits for sale. 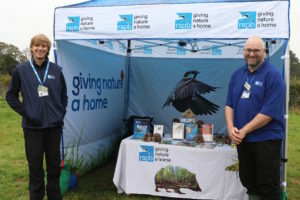 Beekeeping information was available and the RSPB were on hand to advise how to ‘Give Nature a Home’. 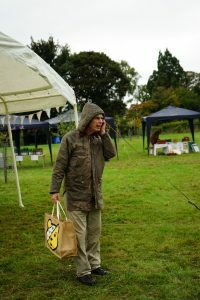 Thanks to a last minute cancellation, we were delighted to welcome apple expert Gerry Edwards to Apple Day 2017. Gerry identifies apples nationwide and we were thrilled to have him along. Visitors brought mystery apples growing in their gardens for Gerry to study. Believe me, he knows his apples (something to do with growing over 250 varieties in his own garden perhaps – his working reference library!). Gerry can also advise on good varieties of apple or pear to plant. Thanks to Annie Simons for the photos. 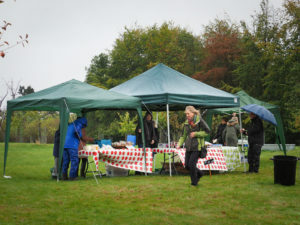 Apple Day on 1st October 2016 was a day of sharply contrasting weather – cool, wet and rainy in the morning then sunny and warmer in the afternoon. 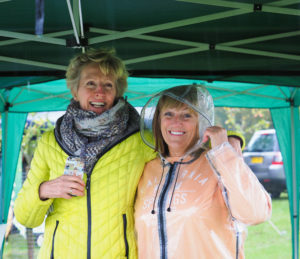 Our intrepid volunteers and quite a lot of our committed visitors nevertheless braved the morning’s rain – the early forecast was rain throughout Apple Day so plenty of British indomitable spirit. The afternoon visitors had it easy by comparison as the sun came out! We were concerned we might not have enough apples this year, as Chorleywood’s apple trees seemed to be having a year off from fruiting (perhaps not entirely surprising after last year’s bumper harvest). In the event we had more than enough and even sent some to be juiced at the close of play. The BBQ was as popular as ever (J & J May have really perfected the blend of sausage meat and local apples) and so was pressing apples the traditional way – children and adults alike are still impressed (and in some cases frankly amazed) that delicious apple juice comes out of apples using only a bit of manual effort and with nothing added! 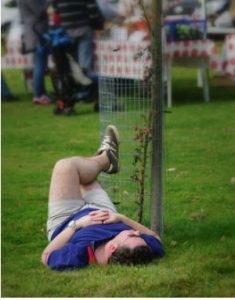 Meanwhile the Cider Club’s 2015 vintage attracted very favourable reviews and some new members were signed up to make the 2016 vintage. Sixth formers from St Clement Danes were in attendance fundraising for their chosen charities: they organized children’s activities including making delicious apple-based ‘mocktails’, and helping younger children make apple animals. 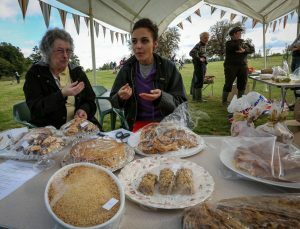 Delicious homemade cakes and local honey sold out early and sales of local apple juice, jams, fruit jellies and chutneys together with unusual varieties of locally grown apples were also very popular. 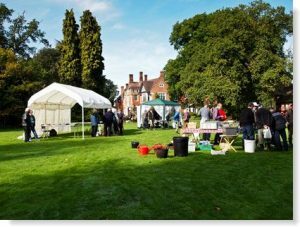 All in all, a very successful day – proving that Apple Day is now a firm fixture in the Chorleywood calendar. 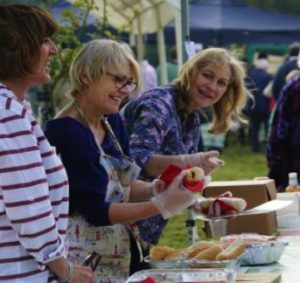 Apple Day 2015 took place at the Orchard in Chorleywood House on Saturday 3rd October. 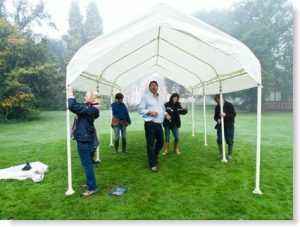 We were hugely relieved that the weather was once again kind to us after the drenching we endured in 2014 (see photos!). A record number of visitors turned out to enjoy this celebration of all things apple. 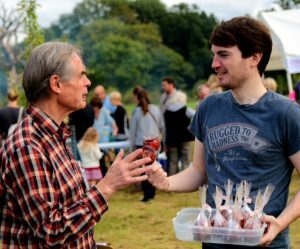 As usual, the star attraction was our famous BBQ serving delicious pork and apple sausages, made to order for us by local butcher J & J May, served with a choice of home-made plum or apple chutney. 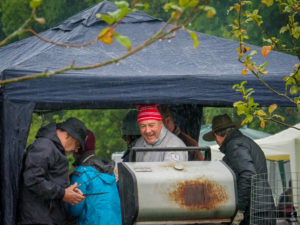 The BBQ team worked flat out from before we opened right through to the end to cope with the demand and sold a record number of hot dogs. 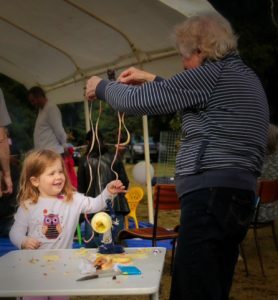 Children enjoyed a range of activities, including pressing apples into juice using our traditional crusher and press, while Little Beans Café and Little Cakes Montessori School were in attendance organizing apple-based crafts. 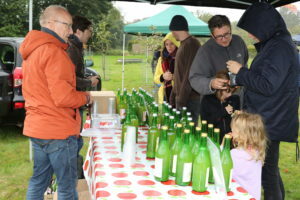 Adults were able to taste our Cider Club’s 2014 vintage (which was very well-received) and everyone could sample and buy unusual varieties of locally grown apples and juice. 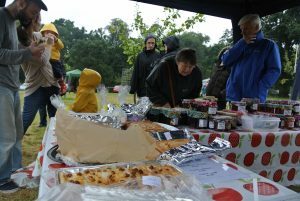 In addition we sold out of home-made cakes, biscuits, jams, jellies and chutney all made by our volunteers from local apples and plums, including lots gathered in the wonderful traditional orchard at Bullsland Farm thanks to the generosity of owner Steve Hayes. Beekeeper Mike Davey was there as usual with his local honey and a display and information about bees and beekeeping, and Waitrose Rickmansworth attended with a selection of their English apples, recipe cards and baked cakes. 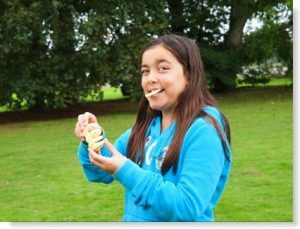 Chorleywood Youth Council sold all their homemade toffee apples for charity. Kate Dyer won the very popular raffle of a hamper filled with local apple and plum products. See below for a selection of photos of the day. After 5 years in a row of being blessed with glorious sunshine on the first Saturday in October, it was obviously only a matter of time before our luck ran out and it did big time in 2014! 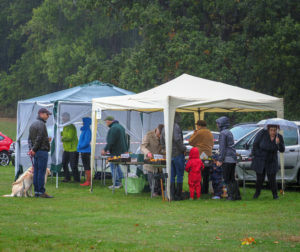 This year was memorable not least for the absolutely precise timing of the deluge – steady rain started at 10.55am, became heavier and stopped at 3.05pm, with Apple Day open to the public from 11am to 3pm. But an amazing 240 visitors refused to be put off! See the following selection of photos for a flavour of the day. 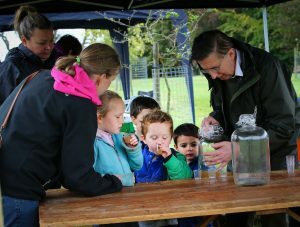 Nearly 600 people attended our 5th Apple Day this year and enjoyed a wide range of apple­related attractions. 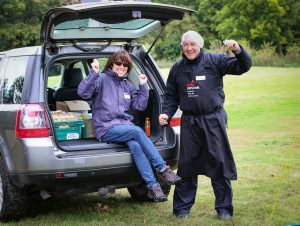 A bumper apple harvest meant we had plenty of apples, juice and preserves to sell, and the BBQ was a triumph, serving over 300 delicious pork and apple hot dogs made by local butcher J & J May. 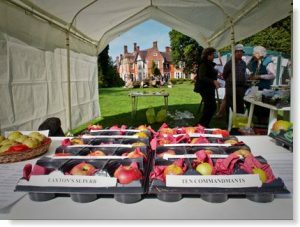 Chorleywood Mums organised a treasure hunt and other activities for children, a guided tour of the Orchard was popular with new visitors and Waitrose brought along several varieties of English apple to taste as well as samples of their delicious apple recipes baked by the staff. The baking competition winners were Barbara Stunell in the adult category and Eleanor Wilkinson in the children’s section. Well done to them and thanks to all the entrants and to Gillian Hill for judging. 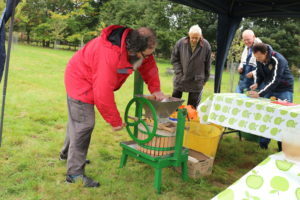 Yet again operating our traditional apple press and crusher was a hit with children and adults, with everyone enjoying the delicious juice they made. 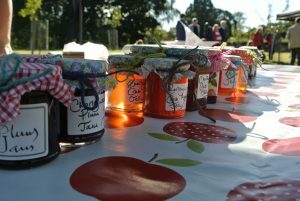 Our bottled apple juice and the chutneys, jams and jellies were a sell­out. 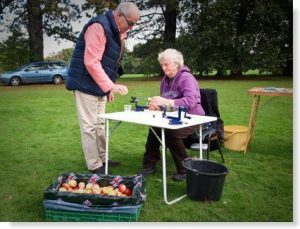 Chris and Sandra Kemp put on another fantastic display of many varieties of local apples grown on their allotments (with samples for tasting) and Mike and Catherine Davey provided a very entertaining display of honey and beekeeping. 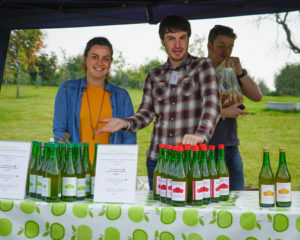 And a new venture ­ cider enthusiasts signed up to a Chorleywood cider club and have since made local cider which, if we say so ourselves, is not half bad! Who knows, maybe one day Chorleywood cider will be more famous (for all the right reasons) than the infamous Chorleywood Bread Process! Anyone interested in joining, please contact us. Finally, If anyone has ideas for attractions to add next year please also get in touch. 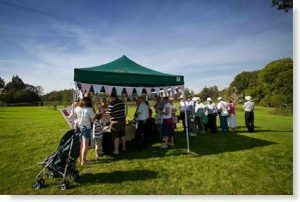 The fourth Apple Day was held in The Orchard on Saturday 6th October and was blessed with sunshine and more visitors than ever before. 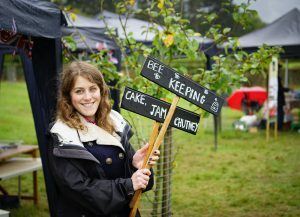 The tents were adorned with beautiful bunting (thank you Charlotte) and it was wonderful to see how the orchard project could bring the community together to celebrate the fruit and its produce. 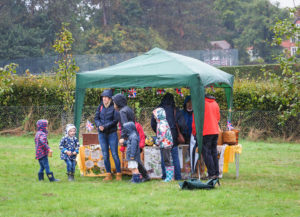 We were joined this year by Chorleywood Mums who entertained the children with craft activities, apple bobbing and treasure hunts throughout the day and we hope they will be part of Apple Day every year from now on. A big thank you to Simone and her helpers. Other attractions included a stall with preserves, cakes and apple juice which was very popular and sold out by the afternoon. A competition for pre-baked goods with two categories for adults and children was judged by Gillian and Francesca. Prizes were awarded to the winners but the standard did make judging difficult – well done to all those who entered. 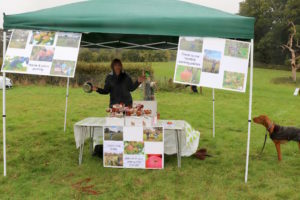 There was a display and tasting of unusual locally grown apples and Waitrose kindly supplied extra apples for juicing as the weather conditions this year meant that there was a poor harvest in local orchards. Thank you again, Waitrose. 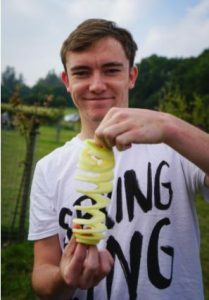 The apple peeling machine was a great attraction and the competition to produce the longest peel was as popular as ever. The BBQ with ‘Higgins’ pork and apple sausages sold out before the end of the day despite having more sausages than last year. Many apologies to all those disappointed and we promise to increase the amount again next year to keep up with demand! 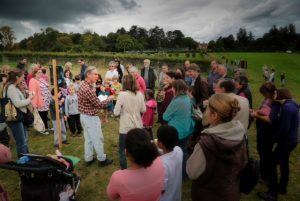 Michael Hyde conducted a guided tour of The Orchard which we hope will now be a regular event as it generated a lot of interest. Thank you to everyone who helped to make the day such a resounding success . On Saturday October 1st we had our third Apple Day and what a day it was! The sun shone and the crowds came! It was definitely a brilliant day out for all the family and everyone had a lovely time. 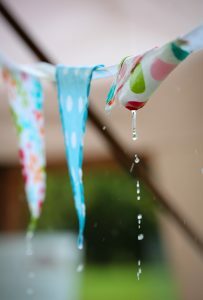 Marquees adorned with bunting stood in the Orchard waiting for folk to arrive and arrive they did! We think that up to 500 came and there was lots to entertain them. 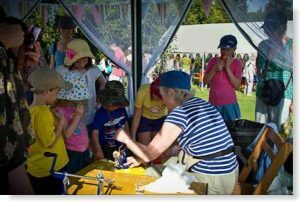 As last year we had the apple peeling machine which the children (and adults!) love. Always a challenge to see who can make the longest peel. Then the crushing of the apples to make juice is always a hit. Queues ‘round the block’ formed for people who wanted their apples identified and children waited patiently to have their faces painted. 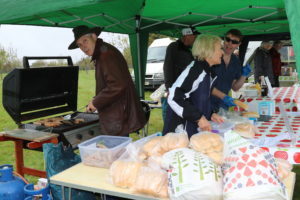 To satisfy every sort of hunger and thirst there was a barbecue serving delicious pork and apple sausages and a stall serving biscuits, cakes and preserves. The toffee apples proved to be a hit and sold out in no time, as did the Apple Juice. 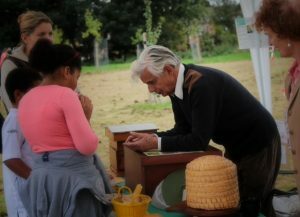 A stall all about bee keeping was a lovely new addition to the day. 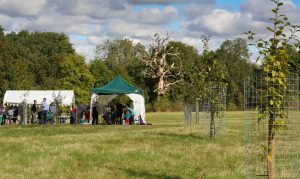 It was so lovely to see families come to Apple Day and sit amongst the trees with a picnic – truly a community orchard for all to enjoy! 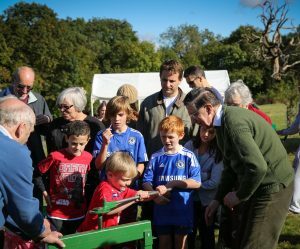 Last year well over 150 visitors of all ages enjoyed the second Chorleywood Apple Day which took place on Saturday 2nd October 2010 in glorious autumn sunshine in Chorleywood House Estate. 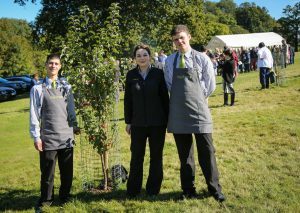 The Orchard’s very first apple, a Hertfordshire variety called Lane’s Prince Albert, was presented to its tree sponsor Christopher Wrigley by Alison Rubens, Chair of the Orchard, to much acclaim. 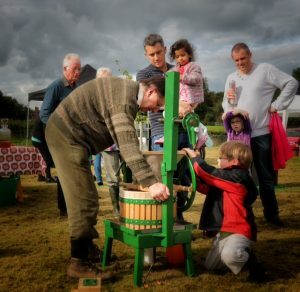 Many people brought their own apples to fill the Orchard’s traditional apple crusher and press and all present enjoyed the taste of the freshly produced juice. Younger children particularly enjoyed turning the handle and watching the juice flow out. At the Apple Peeling Challenge, there was a very competitive spirit, with several contestants, young and old alike, producing extraordinarily long, narrow and unbroken lengths of peel to claim a lollipop prize. 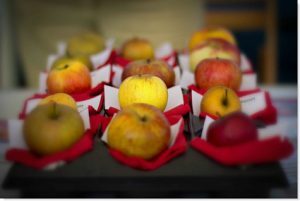 A stunning display of many varieties of apples was on show, either grown locally or drawn from the National Fruit Collection, with names such as Bushey Grove, Tom Putt, Barnack Beauty and Queen. 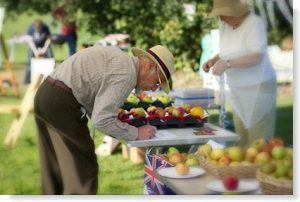 National fruit expert and author Michael Clark successfully helped to identify mystery apples grown in visitors’ gardens. This proved to be very popular and no variety proved beyond his skill to name. The whole day was a classic example of the community working together. Tree sponsors and local volunteers, who have already planted 48 young trees, will be planting another 80 over the coming winter to complete the third planting phase. 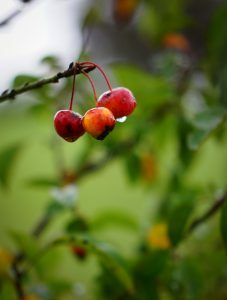 Eventually the Orchard will contain over 130 fruit trees, including plums, cherries, damsons and crab apples in addition to over 50 unusual varieties of apple. 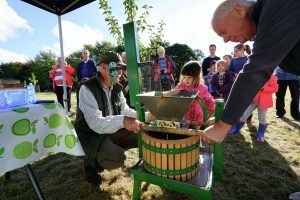 Three Rivers District Council funded the hard-working apple press, while tents loaned by the Chorleywood Scouts and Chorleywood Primary School’s PTA provided shelter. Visitors were also able to walk over to the Orchard to view two splendid new benches purchased with a grant from Hertfordshire County Council.